1. I’ve had people with cochlear implants before ask me why I don’t just use a cochlear implant. One (or two) works for them after all! 2. I’ve had people with hearing aids ask me why I choose to get a cochlear implant in my “worse” ear. 3. I’ve had folks with CI’s and HA’s ask me why I use assistive devices in the classroom if I am “hearing again” so well. 4. I’ve had people with cochlear implants ask me why I need a hearing assistance dog if I’m hearing so well now. 5. I’ve had people who were culturally Deaf ask me why I don’t just use ASL since I am proficient in the language. 6. I’ve had people who were late-deafened ask me why I do not just continue to speech read. Why embrace technology? These are all legitimate questions. I will do my best to answer them. 1. I’ve had people with cochlear implants before ask me why I don’t just use a cochlear implant. One (or two) works for them after all! Not everyone who qualifies for a cochlear implant can go bilateral. I have Meniere’s disease and I barely squeaked by in pre-surgical balance testing to be a unilateral candidate. I use a hearing aid in the opposite ear because – well, because my audiologist told me too! My audiograms and testing each year astonish my audiologist at Johns Hopkins. Who would have thought I could hear this well? However, the proof is clear. I gain an extra 3-7% when I use a hearing aid in my unimplanted ear. 2. I’ve had people with hearing aids ask me why I choose to get a cochlear implant in my “worse” ear. I chose to get a cochlear implant because with the best BTE hearing aids available, I could no longer hear well enough to carry on a normal conversation. I learned all I could about cochlear implants and took the “plunge” in April of 2005. I’ve never regretted it. A comparison of my audiograms can be found at this post: CLICK HERE. 3. I’ve had folks with CI’s and HA’s ask me why I use assistive devices in the classroom if I am “hearing again” so well. I hear great in “most” indoor environments. I even hear outside fairly well if there is not a lot of competing noise. But let’s face it. Listening environments are not the same. Some rooms are huge with cathedral ceilings. Some have all hard surfaces. I use assistive devices because it helps to eliminate one of my greatest enemies. NOISE. Isn’t it funny that as a “hearing again” person, noise interferes with my hearing well? My favorite device as a teacher is my clipboard. You can read about it at this post: CLICK HERE. 4. I’ve had people with cochlear implants ask me why I need a hearing assistance dog if I’m hearing so well now. This is probably the number one question I receive in person, from readers on Hearing Elmo, through FaceBook, and through email. My hearing assistance dog from Fidos For Freedom gives me something that my cochlear implant and hearing aid do not. Independence. 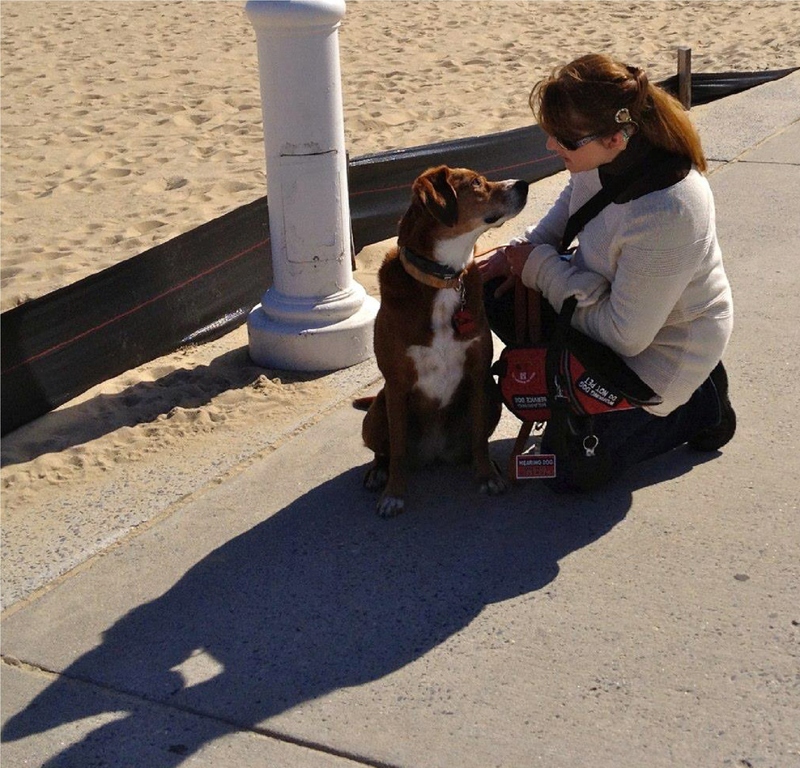 When I trained to be matched with a service dog, I was not only learning the commands, but also learning to watch my dog – and to trust my dog. I needed that training! I am confident in knowing that if I do not hear something, my hearing assistance dog will let me know. This may mean becoming aware that a car is coming up behind me in the parking lot. It may mean that I will know before rounding the end cap, that there is a noisy family on the next aisle. I know if I drop things. I know if intercoms are giving announcements. I know about alarms going off. I know when people are saying “excuse me” so that they can get past, and much, much more. I feel safe. I feel confident. I am independent. I didn’t feel those same things when only utilizing a CI and HA. (Besides with my balance issues, Chloe has become just as necessary to me because of her balance work). 5. I’ve had people who were culturally Deaf ask me why I don’t just use ASL since I am proficient in the language. Bottom line? I am not culturally Deaf. I was not born with hearing loss. Everyone close to me has normal hearing. Don’t misunderstand. I love ASL and have been teaching the language for over twelve years. I actually rely on sign at home if I’ve taken my ears out (as well as speech reading). However, I was born into this world with ears that hear. It made sense (to me) that when I began losing my hearing that I fight to regain as much of that as I was able to do. I do not criticize those who embrace their deafness. I love the culturally Deaf and have learned how to advocate in a positive way from Deaf friends. But… I’m not Deaf. I am a person with hearing loss who is “hearing again”. 6. I’ve had people who were late-deafened ask me why I do not just continue to speech read. Why embrace technology? Speech reading (or lip reading) is not an exact science. Don’t believe me? Try it sometime. Get a friend or family member to voice some simple sentences with their volume “OFF”. Can you accurately pick up what they are saying? According to the CDC (2012), a good speech reader will be accurate 4 to 5 words in a sentence of 12 or more words. I have news for you. 33-50% by the BEST, means they are not communicating well. Even for those who are terrific at understanding “in context”, will still be asking for repeats or clarification (or sit there “lost”). I still speech read some. It is only an additional tool to help me communicate at my best, however. So. Is the way I’ve chosen to stay connected, to communicate, and to hear the world around me overkill? Perhaps to some it is. However, these choices have helped me to cope, to interact, and to be a confident “hearing again” adult responsible for my own communication. If you are a person with hearing loss, you have chosen your own path, too. I respect that! I am grateful to be living in an age where so many options are available to people with hearing loss. Decide how you want to engage the world around you – and then OWN IT. Do you use additional things to hear at your very best? Please feel free to share those options by commenting on this post. 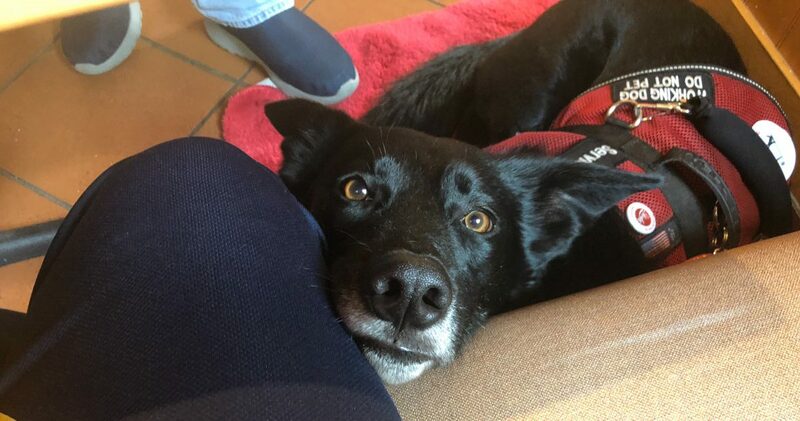 Categories assistance dogs, cochlear implant, cochlear implants, deafness, Fidos For Freedom, hearing assistance dogs, hearing loss, service dogs•Tags ASL, cochlear implant, Fidos For Freedom, hearing aid, hearing loss, Inc.
Chloe enjoys some downtime in between classes. Sometimes, someone just rubs me wrong. I try to practice what I preach here at Hearing Elmo. I know that my interactions with another person can influence their opinion about – for example, all people who have a service dog, or all people who have a balance disorder. Yet sometimes… someone just rubs me wrong and I respond inappropriately. In the early days, if someone made a comment about my service dog, cochlear implant, or wobbly gait, I’d put my hands on my hip and “give them what for”. It was pointed out to me by friends and family that I needed to work on that. It was hard for me not to have a knee-jerk reaction to what I viewed as rudeness. Today, I do better. Yet sometimes… someone rubs me wrong. I had a day like that this week. I went to the copy center to copy an exam I was getting ready to give to eager Introduction to Psychology students. *snort* The copiers are jamming up and not wanting to “do staples” right now, so I brought my exam to the front desk and asked for assistance. As I waited for it to be printed, another professor came into the copy center. I was obtuse on purpose. “Oh, I’m keeping her. I’m not going to give her up“, I replied. “I’m sorry?” she asked, clearly confused. “I’m not going to give her up. I’m keeping her”, I repeated. “But… but don’t you have to give them back?” she asked. 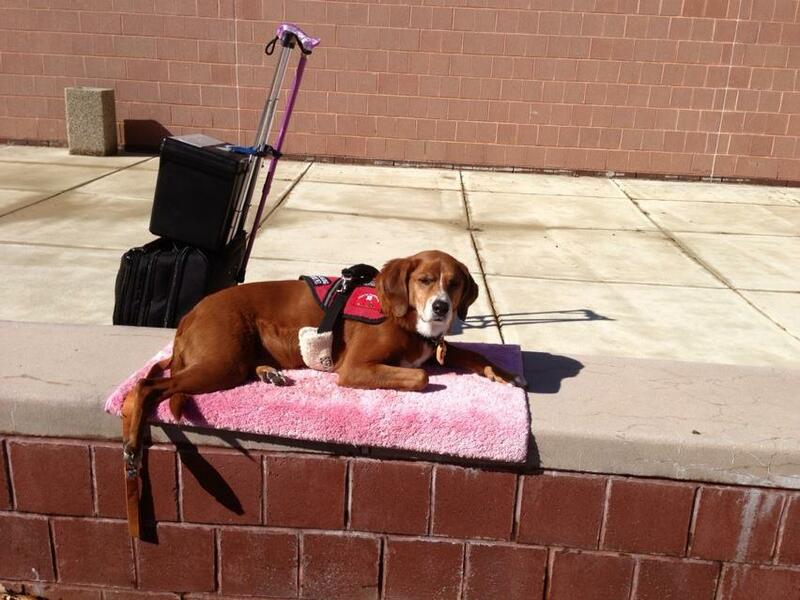 “She’s my service dog. We’ve been together almost 6 years now”, I replied with saccharin sweetness. “You mean a therapy dog?” she asked, still clearly confused. “Oh no. She is an assistance dog. I really couldn’t do my job without her. She’s essential to my even being here”, I admitted. Then she looked at me. She actually took a step to the side to look me up and down. I was incredulous! I shouldn’t have been surprised when she said, “You don’t look deaf or talk like you’re deaf”. With a huge, sweet smile I exclaimed, “Well thank you!” (refusing to even go there). I inwardly chanted my motto… “EDUCATE ONE PERSON AT AT TIME”. She continued to wait in line and watch me. Finally, my copies were done and I allowed Chloe to do “paws up” to say hello to one of her friends behind the desk. He patted her once and said, “Now you take care of your mom, Chloe! Don’t let her fall today!” Chloe wagged her tail and turned to see me out the door. I was obtuse on purpose. And perhaps – a little mean. I’m pretty confident, however, that in this one instance – it may have helped open her eyes at her own behavior. One can hope, right? Invisible illness and disability are invisible. Duh, right? The very nature of what these disorders, illnesses, and disabilities are mean that at first glance, you cannot see them. It may not be until someone bends, or walks, or speaks, or sits that you notice what is really going on with them. Please respect them enough to not ask impertinent questions. The lady sat there a minute stunned. I felt like leaning over and whispering, “Gun it dearie. You are aimed right at her!”. Instead I put a hand on her shoulder (which made her jump) and said, “Some people don’t realize that some disabilities are invisible. Ignore her”. Her eyes filled with tears and she seemed disconcerted by both this woman’s comment and my own intervention. To not bring any more attention to the situation, I patted her shoulder one more time and walked towards the vegetables. Whether you have an invisible condition yourself, or know someone who does, you can EDUCATE ONE PERSON AT A TIME. Perhaps being obtuse on purpose is not the best way. However, you CAN find a way to make a difference! Look for opportunities to do so!